In today’s intraday charts update, we’ll be revisiting our old setups on NZD/CAD and CAD/CHF. And it goes without saying that we’ll be lookin’ for fresh plays as well. If y’all can still recall Monday’s intraday charts update, we had that symmetrical triangle on NZD/CAD’s 1-hour chart. 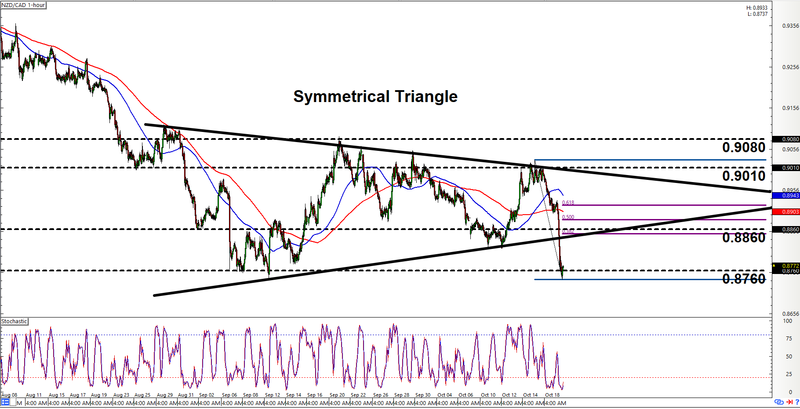 Back then, the pair was hesitating at 0.9010, so I told the gangsta traders among y’all to try and trade inside the triangle by finding opportunities to short near 0.9010 while gunning for the triangle’s support at 0.8860. And, well, the pair reached 0.8860 all right. In fact, the pair did more than that since the pair staged a downside breakout and even reached the key area of interest at 0.8760. So, if you were able to jump in at the breakout point or if you were gangsta enough to go with a short around 0.9010, then congratulations on bagging some delicious pips. Aww, yeah! Do note, however, that the pair’s downward push appears to have stalled at 0.8760. In addition, stochastic is already signaling oversold conditions and all that. There’s therefore a chance that the pair may be pulling back before moving back down again. And if we use our handy Fibonacci tool, we can see that the 38.2% level is the pullback areas to watch since it’s just below the 0.8760. It’s also the closes to the triangle’s breakout point just below 0.8760. Just be ready to bail yo shorts or even switch bias if the pair goes higher and takes out 0.9010, however. 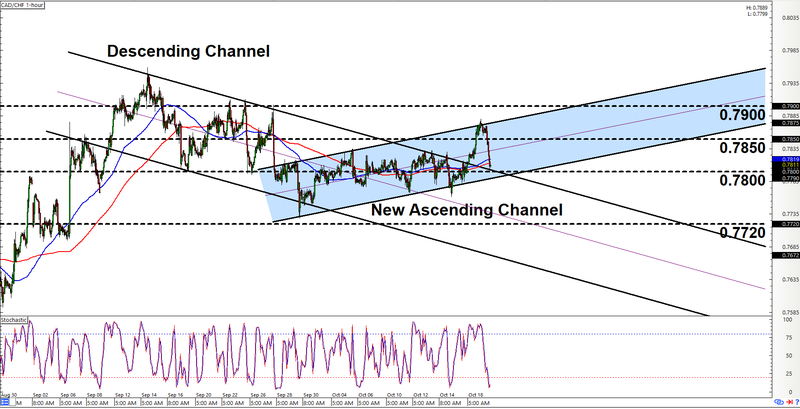 That there ascending channel setup on CAD/CHF was also from Monday’s intraday chart update. And back then, the pair was testing the new ascending channel’s support area, which also happened to be the old descending channel’s resistance area. As such, we had two scenarios in mind, with the first being a bearish scenario where the pair respects the older descending channel and the second being a bullish scenario wherein the pair opts to respect the new ascending channel. And it looks like the pair opted to follow our second scenario and even reached the ascending channel’s resistance area. So congratulations if you were able to bag some delicious pips from this pair. Anyhow, the pair did move higher, but the pair is moving back down again after testing the ascending channel’s resistance area. And since the ascending channel is still intact, and since the pair is making its way to the channel’s support area, today’s play is obviously to play the ascending channel again. And we’re gonna do that by looking for opportunities to go long on the pair when the pair tests the channel’s support somewhere around the 0.7800 major psychological level. As usual, just remember to make sure that you always practice proper risk management, a’ight?